Regardless of the style chosen, it is sure to impress visitors while being functional for the user. We make the reception desks to custom fit your needs. It is important who you choose to help you with your Artopex Reception Furniture needs. Lynne Lemieux has the experience to assist your with your requirements. 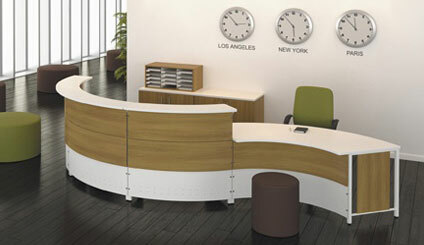 Here we have a 2 person reception desk with a combination of laminate and metal. The 2 different heights provide a flexible area to greet people and also another area to give privacy to the user. Behind it, we have an Artopex pigeon hole unit for filing papers and a matching Artopex credenza for storage. We also have some fun Artopex “Elements” seating as well. I have put this particular Artopex Reception desks in car dealerships, doctors offices, clinics, veterinarian offices, schools, lobbies, design firms and just about anywhere a public image is as must. The Canadian made quality and lifetime warranty gives you the assurance that your Artopex reception desk is a wise investment. Give me a call to help you with your needs.